Cross's early works are "Realist" portraits and still-lifes, painted after his studies with Alphonse Colas and Emile Dupont-Zipcy, under whose aegis he first exhibited at the Salons of the early 1880s. In 1884 he helped to found the Société des Artistes Independants, and came to meet many of the Neo-Impressionists. Over the next few years, as he adopted the Neo-Inpressionist techneque and began showing works done in that style at the Independants exhibition, his career took off. After he and Paul Signac both moved to Saint-Clair near St. Tropez in 1892, they both abandoned the initial Neo-Impressionist dependance upon dots and instead employed what The Grove Dictionary of Art calls "large and blocky strokes." This second Neo-Impressionist style was to influence Matisse and the other Fauves who visited the south of France in the early 1900s. Despite his increasing ill health (eye problems and arthritis), during the last decade of his life he mounted important one-person shows in Paris at Galerie Druet in 1905 and Bernheim-Jeune in 1907, winning both enthusiastic critical response and a market. His works are in the Hermitage, the National Gallery of Art in Washington DC, the Metropolitan Museum in NY, the LA County Museum, the Harvard University Museum, and most other major museums. Selected bibliography: I. Compin, H.-E. Cross: Catalogue Raisonné (Paris, 1964); Maurice Denis, Exposition Henri-Edmund Cross (Paris: Bernheim-Jeune, 1907); John Rewald, H-E Cross: Carnet de dessins 2 vols. (Paris, 1959); E. Verhaeren, Exposition H-E Cross (Paris: Galerie Druet, 1905). Swans. 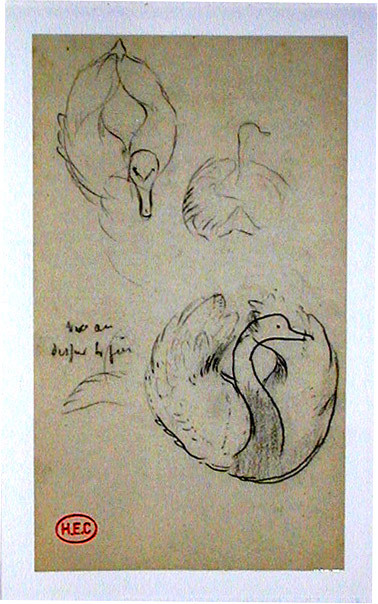 Original ink drawing, c. 1899. Stamped with the Cross estate's studio stamp to indicate it was part of the estate at the time of the artist's death. There is also an unreadable inscription in ink left center. Image size: 170x98mm. Price: $3750. 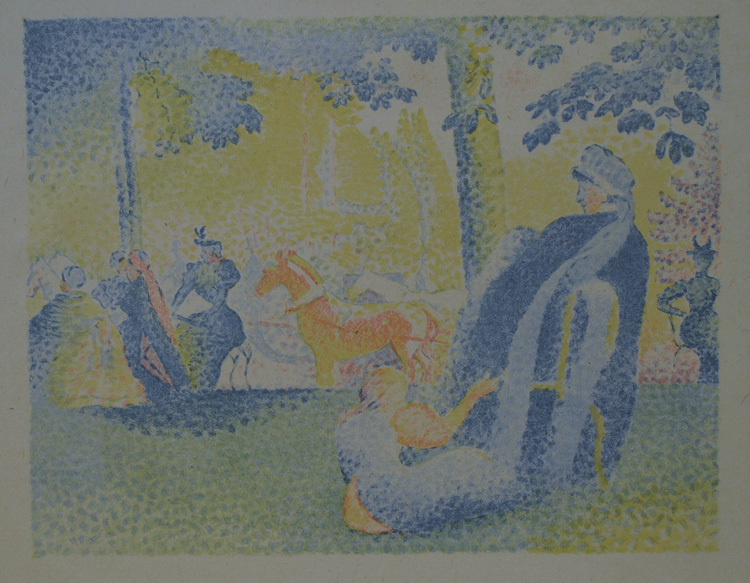 In den Champs Elysee (Davis-Riffkind 456), Original lithograph on Chhine volant, c. 1898. A very good impression with strong colors and good contrast published in the deluxe German art review Pan, vol. 4, no. 1 (1898). Printed text lower left: "HENRI-EDMUND CROSS, IN DEN CHAMPS-ELYSSES PAN IV 1 / FUNFFARBIGE ORIGINALLITHOGRAPHIE" Though there are many Pointillist paintings, there are very few Pointillist prints. This would be rare in any condition; to find such a strong impression is rarer still and almost enough to make one wonder whether this might have been a proof for the edition in Pan. Image size: 202x261mm. Price: $4000. 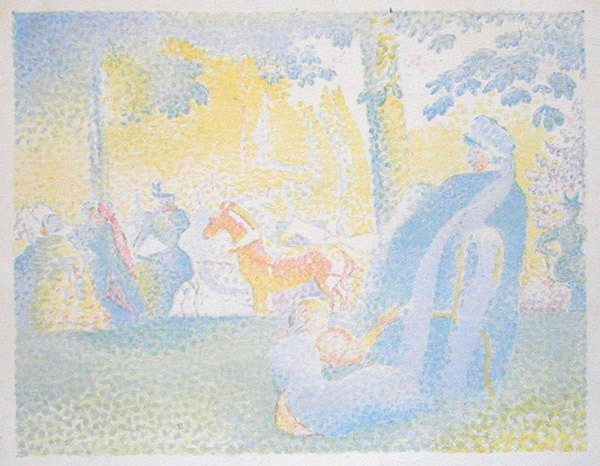 In den Champs Elysee (Davis-Riffkind 456), Original lithograph on Chhine volant, c. 1898. Published in the deluxe German art review Pan, vol. 4, no. 1 (1898) . Image size: 202x261mm. Price: SOLD.